Pen and ink with watercolor pencils. 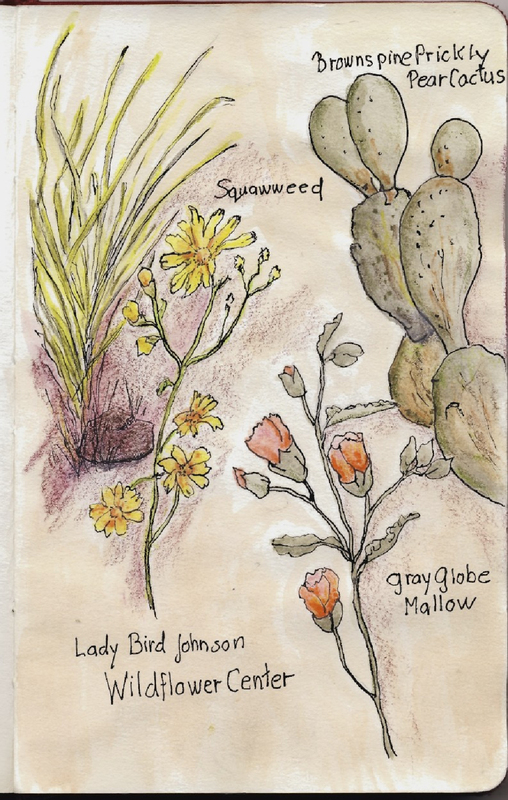 Last week-end I was able to enjoy a sentimental return to the Lady Bird Wildflower Center outside of Austin. Ten years ago I had visited the gardens on the only four generations trip - Liz, Mom, Calli and I - were ever able to take together. We toured the McNay Art Museum in San Antonio, listened to Mariachi bands while we ate delicious Tex-Mex food, walked along the River Walk...and of course toured some historic home districts, and visited not only the Wildflower Center, but the Botanical Gardens as well. The sight of Calli eating and enjoying prickly pear cactus was a real high spot of the trip. Mom died the following year. That trip to the Wildflower Center was in the late fall, in a spitting little rain with very few flowers in bloom. However, the beautiful stone buildings and terraces set against the fading green hills were beautiful. Live oaks and prickly pear cactus contrasted softly with the gold and red rock walls of the buildings and tower. Bernie's and my return to the garden was on a blazing, bright Texas afternoon. Late in the day, as the sun moved towards the horizon, the sky turned a radiant shade of blue above the almost leafless trees, and the rocks below glimmered with shades of iridescent gold and copper. The low sunlight bouncing off the stones began illuminating the tall grasses and they too glowed with reflected light that seemed to come from within. Nearby, we could hear the gentle coos and clucks of that most awkward looking of birds, the Roadrunner. I chose to sit in a covered breezeway and attempt to draw what lay before me. My face in the sunlight, my back chilled by the cool winds behind me, I pulled out a pen and pencil and set to work. "Oh I could never do that." ...and the always discouraging to hear, after they look at my work, "Are you an artist?" In front of me the glowing tower loomed, the grasses waved, buds on trees seemingly grew before my eyes, but I stayed fixated on a mass of tiny backlit orange blossoms in front of me. Perhaps I should just attempt little bits and pieces of botanicals, like Edith Holden1. Visiting the garden center with its wildflowers as well as grasses, plants and trees of the Texas landscape is a lovely way to spend a few hours. There are several short trails at The Center leading through scrub woods and meadows that in Spring are awash in bluebonnets. Thinking about Mom and our trip ten years ago made me wish that she and Calli could have gotten to know each other better. I am sharing this photo because, as you can see, the two of them were already becoming the best of friends, and it makes me smile to look at them together. Oh Peggy, the picture of your mom and Calli was so touching. I am sitting here crying missing my mom so much. You are such a great photographer, I sure wish you could have been here last summer and had used your beautiful heart of photograhy on us. I miss my mom every day of my life. I loved Ladybird because of her passsion for flowers. Here in Estonia I see the old generation passing away. We are now the oldies! That is life, I guess. Awwwww - lovely, Peggy. So sweet to know that all four generations made this trip together. Really miss Pa too. I think she knows you visited again. What a sweet story and I remember you gals taking that trip like it was yesterday. Your mom was a great lady. Liz gave me a little bunny tchotchke that I think your mom had in her house and I think of your mom every time I see it. Amy, Mother's entire bathroom was decorated with all things bunny. Yes, she does know and her spirit was right there enjoying it all again with you. I had that situation in Ireland when I could feel Mother's presence next to me. She had always wanted to go there to visit her cousins. Now I feel that we were there together.